Willis William Ritter, United States District Judge for the District of Utah from 1949 until his death on March 4, 1978, was the one judge whose name was familiar among those who had little or no idea of the difference between judicial jurisdictions. 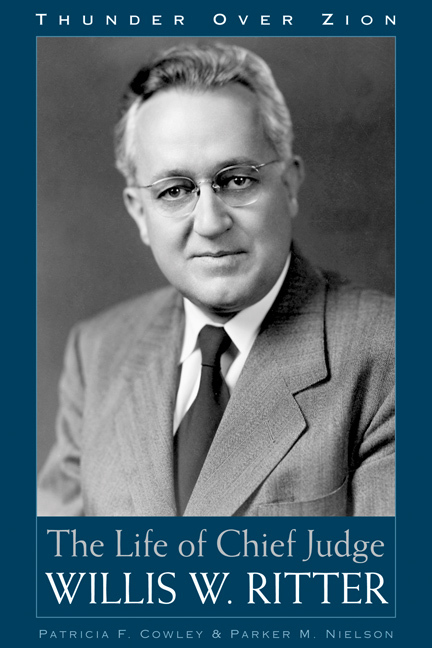 Many knew him by the broad gestures with which he challenged bureaucracies and the federal government itself. He was, legally speaking, a friend to the underdog. Yet at his death scarcely a friend was left and he had become the object of ridicule, outrage, pity, and contempt. Ritter was clearly ahead of his time, for his opinions on criminal justice, police interrogation, and the rights to counsel have now become accepted standards in jurisprudence. They are, indeed, so universally accepted that few if any viewers of televised police court dramas would even question them. In his personal life he was a man flawed on a grand scale and he lived a life fraught with contradictions. This is his compelling story, compellingly recounted. Patricia F. Cowley received her B.A. and M.A. degrees in English from the University of Utah. She was active in local and national Democratic Party politics. Parker M. Nielson received his J.D. from the University of Utah College of Law. He is the author of The Dispossessed: Cultural Genocide of the Mixed-Blood Utes.